The North American Hockey League Draft was conducted Tuesday, June 7, and two players with Arizona ties were selected during the event. Forward Mason Vukonich, a Chandler native, was picked by the New Jersey Titans in the fourth round (88th overall). Vukonich played for the Jr. Coyotes’ 18U AAA team last season where he totaled eight goals and 33 points in 32 Tier 1 Elite Hockey League games. He also saw five games on a call-up basis with the Madison Capitols of the United States Hockey League. Then in the 11th round with the 242nd overall pick, Gilbert native and Arizona Bobcats product Christian Cakebread (pictured) was chosen by the Shreveport Mudbugs. 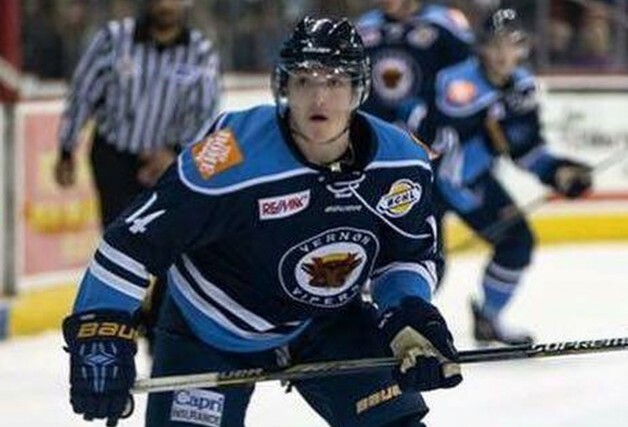 The forward and University of North Dakota commit played for the Vernon Vipers of the British Columbia Hockey League in 2015-16 and posted 12 goals and 30 points in 35 games.